Hotel de France (フランスホテル) at No. 33 Oura in Nagasaki around 1905 (Meiji 38). 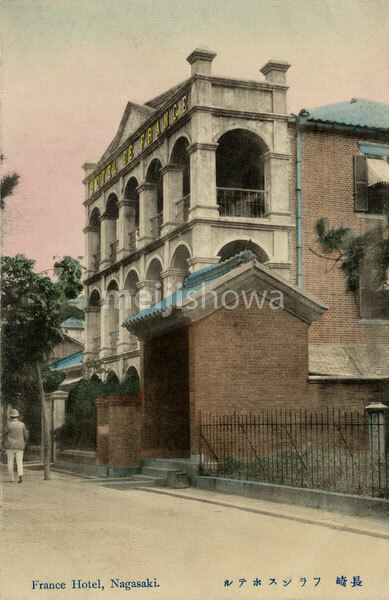 The hotel was established in 1903 (Meiji 36) and closed in 1909 (Meiji 42). The gate in the foreground is the entrance to the Confucian Shrine (孔子廟, Koshi-byo), which still stands today. Currently the NTT Hospital (ＮＴＴ病院) stands on the lot.